Downtown Spokane has an enviable problem: It’s too popular. The demand for big downtown retail space has outstripped its supply. In some cases, that lack of space has cost the city major retailer opportunities, he says. “They’ve had to turn away H&M and other larger prospects downtown because we don’t have space to provide them,” Richard says. 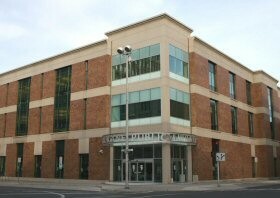 That’s where the Downtown Spokane Library, just west of the River Park Square shopping mall, comes in. The DSP has raised the possibility of the library finding a new, more accessible location, allowing the current building to be turned into commercial retail space. Richard says he met with recently hired library director Andrew Chanse about the possibility, and encouraged him to think about it. “To me I see there’s a possibility of a win-win,” Richard says. In particular, he draws a parallel to the YMCA, which sold its dilapidated Riverfront Park property, then used the money from selling the valuable land to improve their North Monroe facility. But Chanse says that while he did talk with Richard about the notion, the library is focusing on a lot of other issues right now. “I think that as a service point, you need to keep our options open, but it’s not something we’re seriously looking at at this point, no,” Chanse says. Choosing to change buildings would require a long, long process, he says, and serious discussions haven’t really even started yet. Mark it down as just another possible “idea” that local leaders have brainstormed as a way to improve Spokane – but a potentially controversial one, a long way from becoming a reality. Richard also confirmed that many of the same retail-space considerations had also colored the conversations between the River Park Square-owning Cowles and their Mobius Science Center tenant, which has struggled in its downtown location. While malls across the country have been fading and struggling, River Park Square has been thriving. “If I had another two blocks of street front we would [still] be full,” Bryn West, the general manager of River Park Square told the Inlander last fall. UPDATE: Eva Silverstone, communications manager for the Spokane Public Library, sends an email explaining that, in its current location, the downtown library sees a frequent amount of use. In fact, despite the age of the Internet and ebooks, and despite limited hours, the library district has been thriving lately. Over 22,000 people a month use the downtown library; in December 2013 27,581 items were checked out from Downtown (a 6.1% increase over December 2012). The downtown location is useful for many business-people who come in on to check out material. The library is also used by tourists (we keep a map at the reference desk showing where travelers come from). Tourists use the library for internet access, free wifi and a place to get information about Spokane amenities. Since the downtown visitor's bureau has closed there has been an increase in inquiries from out-of-town visitors. The library serves people of all ages with storytimes for toddlers and preschoolers, programs, exhibits and information resources for all ages. The free meeting rooms at the Downtown Library are actively used with many groups making the Downtown Library their preferred meeting space because of its easy access central location. In other words, unless there's a big swing in circumstances or in the Spokane Public Library administration's vision, the conversations between the Library and the DSP probably say more about the downtown retail situation, and the DSP's desire to find a solution, than a real possibility that the library will move.